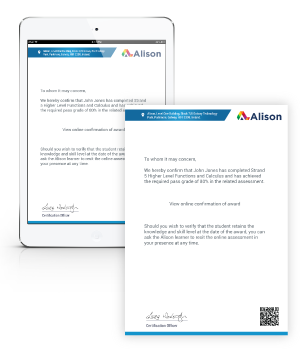 Alison can provide on request an "Attestation Letter" which provides further formal proof that a registered learner has achieved learning success with Alison. The Attestation Letter will state what award was achieved and what course was graduated from and how the award can be further checked online, via a certificate link or by in person testing. Free PDF Letter (downloadable from dashboard after purchase).